Yesterday’s skiing lesson didn’t go quite as planned. I blame the boots myself. You know if they had given me the normal black boots I’d’ve been great, I would have been my usual self. I would have had the confidence I was bubbling over with the week before. Really I think it was those Star Wars type boots that did me in. There were just two of us in the class yesterday. Just me and a chap who was very tall, very thin and very, very determined. It turns out his girlfriend had booked a skiing holiday for them both in January so he was now A Man On A Mission. I wasn’t on any sort of mission and was sporting a very odd pair of boots. We started off okay, half way up the main slope just skiing down, snow ploughing and practicing our turns. Mission Man was very competent, I was impressed. He was cool, he was calm and his turns were so smooth he could’ve skied uphill. Last week the slope had been the playground of the school holiday kids, this week it appeared to be the playground of the snow boarders. Now I have nothing against this sport, heavens no, Idgy is taking lessons and loves it. 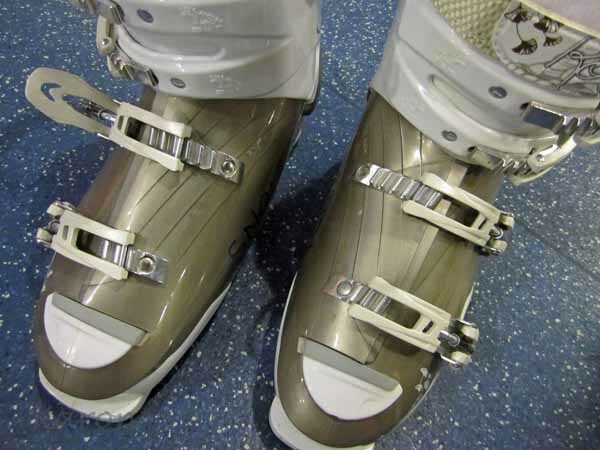 In fact I far prefer the boots (much lighter than ski boots) and the outfits also do more for me than the trad ski look. But sorrreeeee all that flashing about, doing tricks and flying through the air when we wobblers are trying to get down the slope in One Piece, ee gads it was scary out there. I might have been fine if it hadn’t been for the big good looking brute who shot past me at such high speed I was nearly flattened by his jet stream. I wobbled precariously, I lost my balance a bit and just managed to stay upright, but alas my confidence had taken a knock. The situation was made Much Worse when I went up the Pomo (funny ski lift thing that you sort of semi sit on and it drags you up the slope) and fell off. Yes girls, I am ashamed to say that I fell off the bloody ski lift. Not only did I fall off the thing, but it dragged me up the hill a bit before smartly dumping me on the shiny slippery icy snow at the side of the slope. The Pomo lift stopped. Of course it did, a kind member of staff stopped the mechanism at the bottom. Everyone on the lift was then stuck where they were, and guess what – they were all looking at me. Yes good old me, splattered on the slope and stuck there like a limpet on a rock. Immobile due to the skis and with no way of getting up. Oh the indignity, oh the shame. Wait while another horribly young and handsome youth comes to my rescue and removes the skis and helps me to get upright again. He is just telling me to be careful as this is the icy part when I preempt his words and topple over skittering down the hill. At least they have cleared me from the ski lift area and the thing starts up again and people move onwards and upwards and away from me. Handsome youth finds my skis and helps me onto them again and charmingly encourages me to teeter down the hill again. The instructor assures me that he falls off the lift on a frequent basis, I am not altogether inclined to believe him, but know he is saying this for the right reasons. We resume the lesson, but alas by now any confidence from before has gone with the proverbial wind. I grit my teeth and launch myself from the top of the slope (oh yes I have tackled the damn lift again and made it up the hill to the top this time). I feel a bit nervous but then feel things are going fine, I’m snow ploughing and turning and not going too fast. Ho hum, it is at this point that I spot a fast approaching snow boarder out of the corner of my eye, I start to lose concentration worrying that he will crash into me, I waver and haver and don’t know which way to go. I go downhill, I go downhill fast. Way too fast. Too fast for my snow plough to contend with, my turns are out of the question and I have taken up the uncontrolled speeding of Bridget Jones on her skiing weekend. I feel myself bleating and know I have panic written all over me, this is not going well. Do I have to tell you that I didn’t pass this level of lesson. ‘I’m afraid you’ll have to take this class again, must build up your confidence’. I still blame the star wars boots…….